Kubota RTV: South Africans are renowned for being able to “maak n plan” and pioneering many solutions to complex problems. This is especially true in the mining industry, where we are world leaders in deep underground mining expertise. Jaco and Kevin from Maubra. Of course we have to thank the gold and diamond mining industries for this. One of the aspects of mining where we also lead the World is in mining safety. Considering the thousands of underground workers and the number of hours they toil at the rock face our safety record is second to none. Deep down in the bowels of the earth one of the most important tasks is getting equipment, technicians and all sorts of other supplies like explosives from the shafts to the rock face. This is a very complex issue because of the layout of a deep level mine. Hundreds of kilometers of tunnel fan out from the shafts leading to the surface. Everything in these tunnels has to be brought from the surface..personnel, air, water, equipment, supplies and much more. Kubota has several features which make it ideal for many underground tasks. 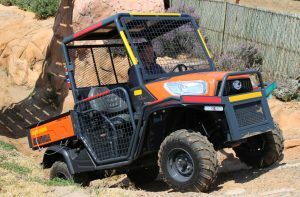 As delivered from the Kubota Tractor company in Japan it is an excellent base vehicle. 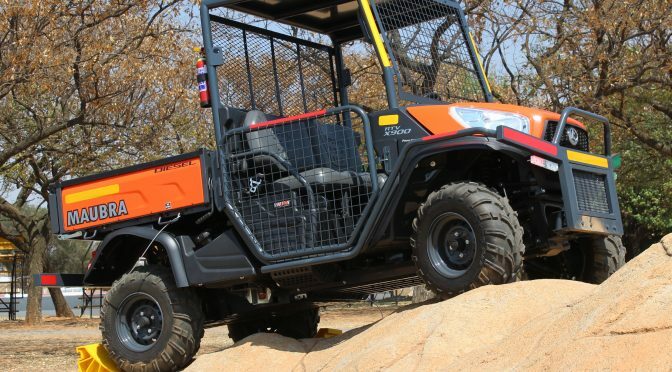 It has a powerful diesel engine of just under 900 cc, it has a unique fluid drive transmission system which can drive either the rear wheels or all four, and it has also has a unique braking system linked to the fluid drive transmission. In addition to driver controlled braking through the brake pedal, this side by side can only move if the transmission is engaged and the throttle is pressed. In any other mode there the wheels cannot turn. If the engine is off the vehicle cannot freewheel, so there is no chance of it running away down an incline. If the throttle is not pressed and the engine is idling the transmission will not deliver enough fluid to turn the wheels, so it cannot run away in that mode either. 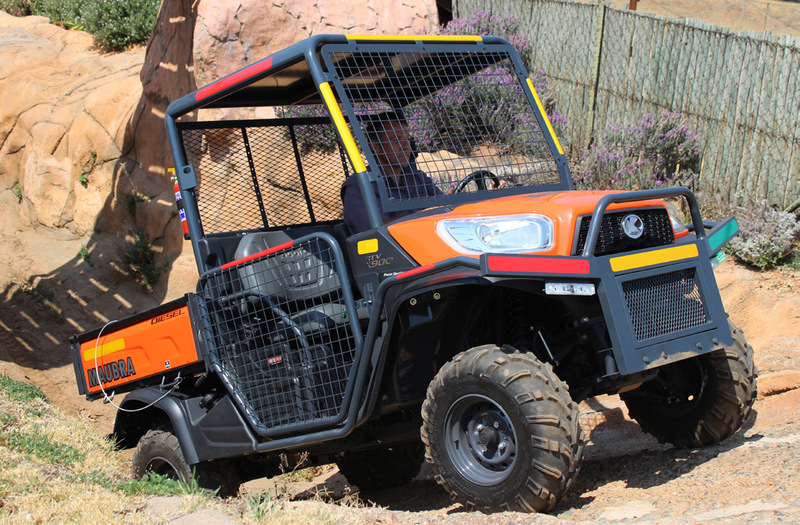 Although the standard RTV900X is an excellent base vehicle the stringent requirements underground mean that it must be specially prepared for each of the specific tasks it must undertake. 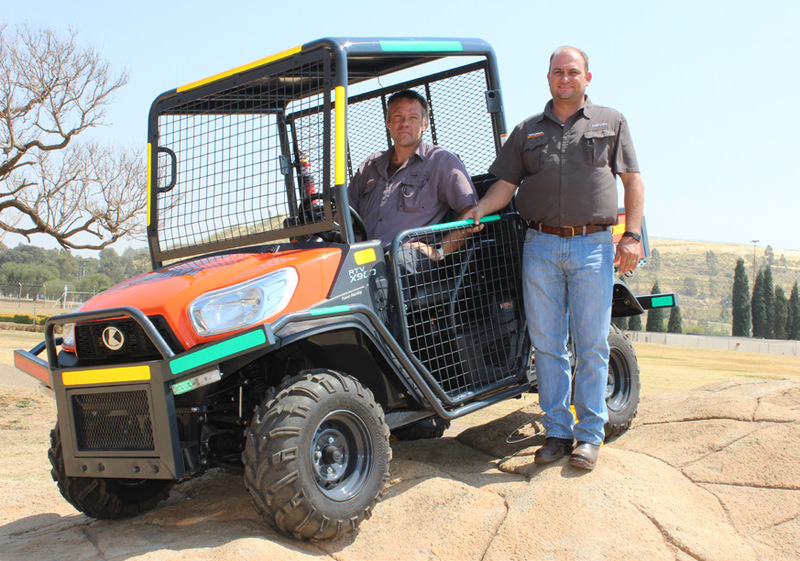 Maubra, one of the Kubota dealers in South Africa, specialises in designing and preparing them for underground use. 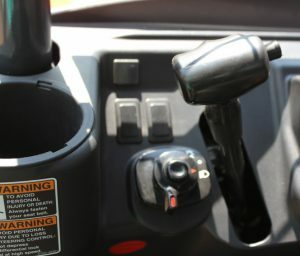 Safety is of the utmost performance, and the base vehicle is fitted with a strengthened roll cage, special purpose front and rear steel bumpers, steel lattice driver and passenger doors, a full array of Led auxiliary lights, including nautical style red and green side lights so that its’ direction of travel can be seen at a glance in the dark, and the entire floor surface in the cab and the load bed is coated with a rubberised non slip material. has a strictly enforced speed limit underground, with the fastest being 15km/h, so Maubra govern them to the required limit. 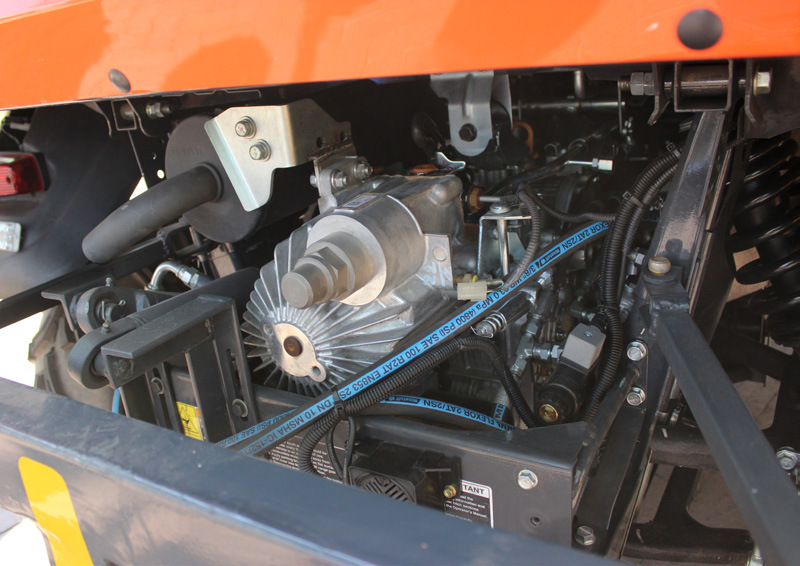 Thanks to the diesel engine there is no HT electricity powering the engine , and every other electrical component is insulated to prevent any chance of a spark igniting any combustible vapour underground. In this form the Kubota RTV900X is used as an underground utility vehicle. Maubra then modify them further for other specific tasks. For instance more safety precautions and extra equipment is fitted to one carrying explosives. There is a first aid version equipped to reach accident victims quickly, provide first response treatment and extract them from the area. In some mines the requirement is for all these vehicles, but the low roof of certain tunnels requires that the height of the vehicle must be less than 1.4m. 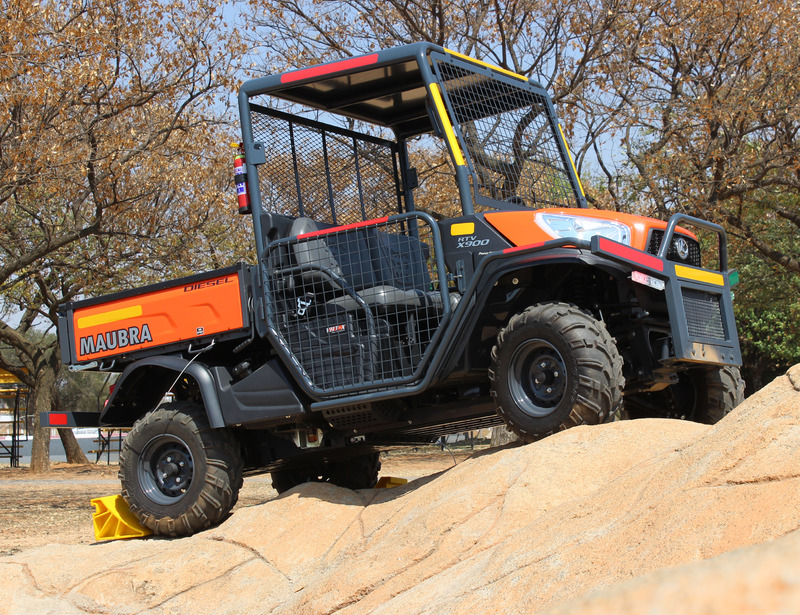 In these cases Maubra modify the RTV 900 by lowering the floor-pan,the seats and the height of the roll cage. On comparing the price of a standard 900 Kubota diesel side by side one is struck by the fact that they are close, if not more, than a small utility pick up truck in SA. So why would a farmer, a mine or even a factory buy a side by side instead of a bakkie? There are a couple of reasons. Firstly they tell us that long term maintenance and ease of maintenance of the Kubota side by side is far less than a bakkie. There is no clutch, no brakes pads or shoes and a very simple and rugged 3 cylinder diesel engine. Furthermore the Kubota is much simpler to operate, even a relatively inexperienced person can learn to drive it in minutes. This article was featured in the Dirt and Trail – Feb 2017. Article was featured in SA Mechanical Engineer – July 2017. Article featured on the Projects Magazine [click here]. This was an exclusive article in the Plant and Equipment Hire – Sep 2017.